KCP&L power outage map as of 2:25pm Tuesday. An onslaught of winds and continued heavy snowfall are dropping power lines indiscriminately around the Kansas City metro region. Drought tree-kill is factor in winter storm power losses. A measurable six inches of snow had fallen by dawn, although "fallen" doesn't really describe it. The wet snow is plastered onto most horizontal and vertical surfaces. Tree limbs, power lines are exposed to being damaged. 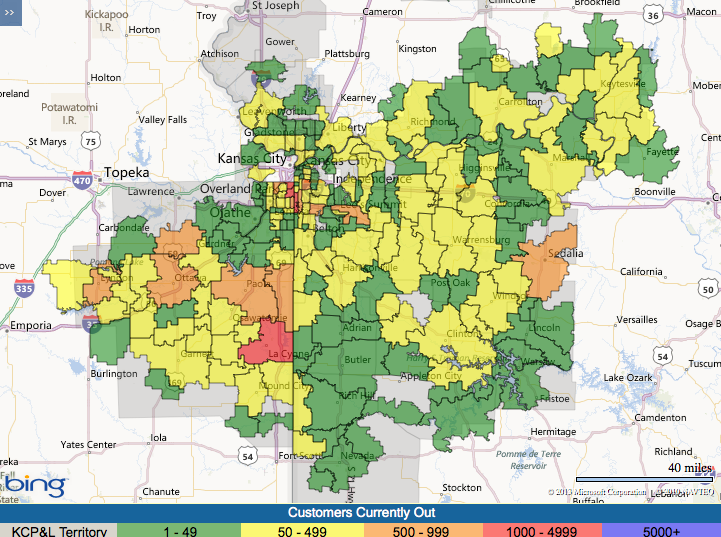 KCP&L's power outage map is rapidly changing. To see current outages, click here. At one point in the 6 o'clock hour, some 2,000 customers in the Overland Park area were disconnected. The Lee's Summit and Blue Springs area had growing outages. Clusters of a few hundred were around the region. Meteorologist Mike July at the National Weather Service sees wind and snow-weight taking their toll--"a combination of that heavy wet snow on top of the branches, especially the weakened branches from the drought, some of the trees that may be diseased are more susceptible to breakage." July said this morning that, "we are getting quite a few reports from throughout the area, not just Kansas City but over into Sedalia and into Chillicothe." July does not expect winds to rise much more than they are now, 25 to 35 miles an hour. But it is enough to take out electrical service. Forecasters expect snow to continue falling through the afternoon. Total storm accumulation is predicted at up to a foot of snow in southern suburbs, lesser amounts near KCI Airport. Ice beneath the snow makes travel exceptionally treacherous. 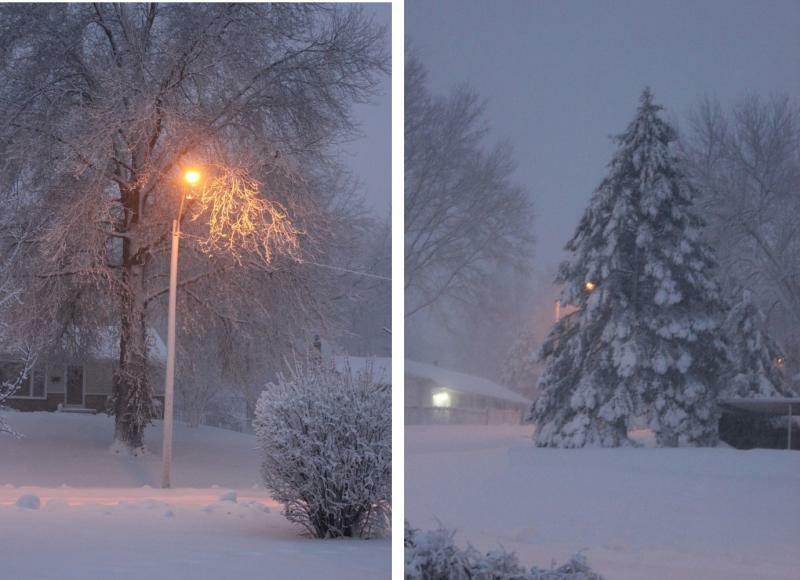 A heavy, wet snow continues falling over metro Kansas City with steady winds strong enough to threaten power outages. Some areas were reporting light snow and ice in the early hours of Monday evening. The storm is expected to continue through Tuesday afternoon. 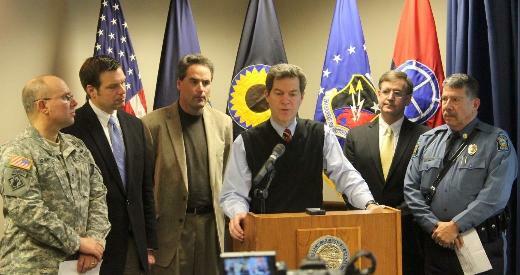 Governor Sam Brownback and state officials are urging Kansans to prepare for the storm that’s sweeping across the state. Brownback says the winter weather has already caused one fatality in Kansas.